Tangkula 6 in 1 Multifunctional Heat Press Machine is premium among the market. Our Hi-tech microprocessor program ensures you get the finest graphics on your T-shirts, caps, hats, plates, mugs and so on. Besides you will not worry at all about safety problem due to our dual safety protection. Seek no further, this is the most cost-effective heat press machine that you can find. What are you waiting for? Main Heating plate size: 15'' x 12"
Heat/Cap pad printing area: 5.5" x 3"
Mug printing area: 5" x 9" & 5" x 7.5"
Plate printing area: Max 5" & 6"
【Hi-tech Microprocessor Program Control】This Tangkula heat press machine features high precision writing parameter memory and unique touch button control panel that offers you convenience for creating the most impressive & the highest quality self-created works. 【Automatic Digital Timer & Self-clocking Alarm】With this automatic timer function you can preset the pressing time and the self-clocking alarm will sound when the process is complete, which helps prevent from over exposure. 【Stable & Sturdy Bottom Base】Bottom base is made of upgraded & thickened top level Teflon-coated aluminum plate, and with 4 stable anti-slip pads the machine will always stay in place while working. 【Dual Safety Protection】Adopted with new generation "K" upgraded version heating thermocouple, with double lines merged, it is safer and stronger compared to those normal heat press machine. Moreover, a heat-resisting foaming silicon is added on the baseboard, which can stand 400 centigrade degrees and not deform. 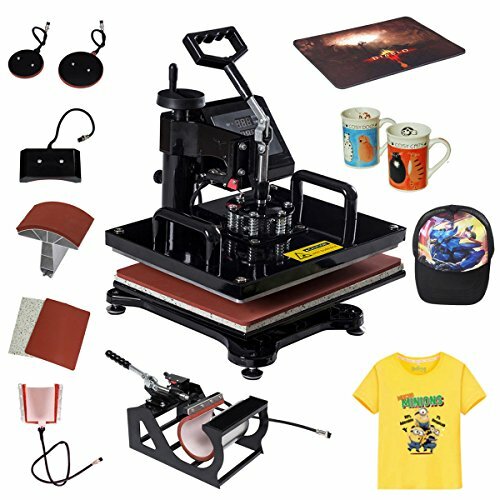 【6in1 Multifunctional Heat Press Machine】6in1 360 degrees rotatable heat press machine, this multifunctional machine is perfect to transfer letters, images, numbers onto T-shirts, caps, hats, plates, mugs which also fitting in transferring onto cotton, fiber, metal, ceramic and glass objects, etc. You will absolutely have fun with this machine.